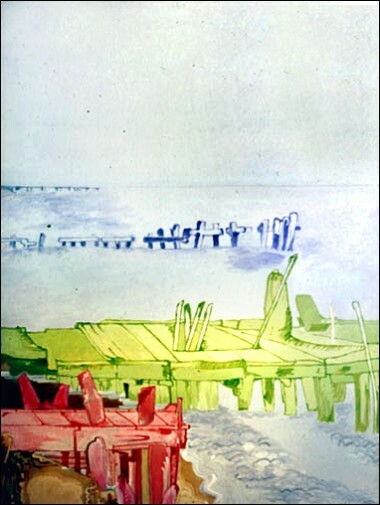 The artist's interest in the architectural use of timber and the artistic effects achieved by weathering is seen in this acrylic painting based on drawings done in the bayside area of Melbourne. It is a popular recreation area where the piers, running into the sea, gradually become more deteriorated as one moves closer to the harbour of Port Melbourne nearby. The artist executed a number of drawings of these piers in various stages of decomposition. In the scheme of the painting a flat blue tint was laid onto the white primed canvas, the design commencing with the simplest indication of a pier in the far background merging into the fine of the horizon. The presence of the sea is indicated by a slight wash of a deeper tone brushed in below the timber structure. The centre of the canvas is taken up with fragments of an old pier where little more than the stumps and some planks remain. Although at this point it is still sketchily indicated, the cobalt blue used is denser and flat areas of colour make an appearance. It is joined to a pier which is more elaborately executed by Matthew Moss painting shadows in the sea. This platform, in light and dark greens cutting across the canvas in the lower centre, leads the eye to the foreground where waves break onto an ochre coloured beach containing a foreground pier in strong reds. The eye is drawn downwards, from the simple fines at the top to the stronger colours and more complex design of the centre of interest in the lower part of the canvas. The overall blue of the background provides a neutral setting against which are set off the shapes of the old and worn timber structures.